In this article I will let you know about Windows Defender Free Antivirus (mpam-fe) best free antivirus for windows 8 or 8.1/7. If you want to run your windows pc or system as smoothly and speedily, you should use good antivirus protection on your windows pc. Most of the people they can operate their laptop or systems without antivirus. That time they may have chances to lose their important files from windows pc and OS also might be corrupt. What other features your system don’t have that is not a problem, but requirement of effective antivirus protection is important. 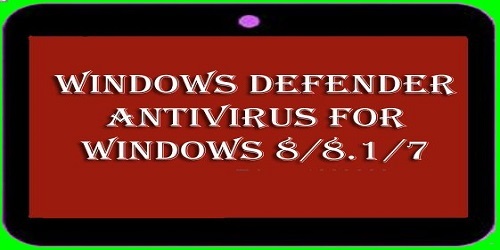 Any way I will tell you the best and free antivirus for windows 8, 8.1/7. That is windows defender. Windows defender is a best free antivirus protection on windows 8 or 8.1/7, it can scan deeply and find viruses, spyware, and malware from your windows system. It is really very good antivirus protection. 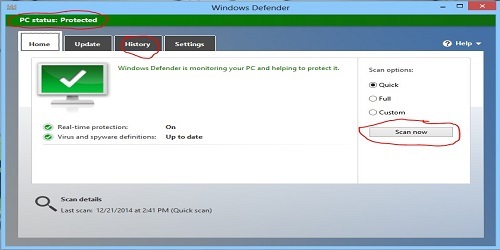 If you are using windows 8, 8.1/7, you can see windows defender on your system. Just make sure that enable windows defender is in ON. 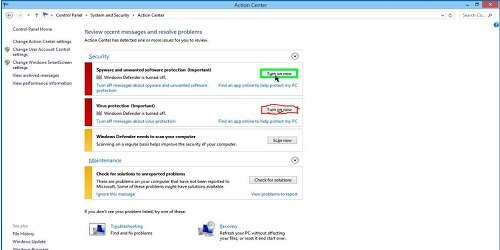 Before going to enable that option, if you are installed any other antivirus protection, you should uninstall those antivirus protection, otherwise you cannot turn ON that windows defender on your windows pc. You can compare any other antivirus protection with this windows defender, 100% I can say windows defender is better, because of its wonderful functioning. It can make your computer/pc or laptop clean and green. What is quick scan type? Quick scan examines the regions that malicious software, letting in viruses, spyware, and not wanted software. What is about full scan type? Full scan examines completely on your hard disk and examines all working programs. Scanning time depend on your system. What is custom scan type? Custom scan can examines only the fields and files which you select. Turn ON windows defender on windows 8 pc or laptop? Before going to turn on windows defender on windows 8 pc, you have to remove other installed antivirus protection. Otherwise windows defender will not work on your pc. First open control panel, after opening of control panel you have to go next to system and security, tap on that system and security, you will see action center in top. Lastly you click that and you will get the windows defender turn on/off window like below. Like in the below window you have to turn on “spyware and unwanted software protection (important). And next to turn on virus protection (important). After turn ON of windows defender has done, update that and make into use. Get the internet connection and start updating. Once you updated that windows defender on your windows pc, it can scan and find you all virus and make your system from free virus. Manually also we can update windows defender. For that we have to download the windows defender installer. We can call it as” mpam-fe.exe”. How to Do Manual Update for Windows Defender on Windows 8 and 8.1/7 pc. If you want to do manual update for windows defender you need to download windows defender installer (mpam-fe.exe). Before going to download that installer you should know what type of version of windows 8 using. If you are using 64-bit version, you should download that version of windows defender installer only. If you are using 32-bit version, you should download that version of windows defender. After completion of downloading, apply double click on that downloaded file (mpam-fe.exe). After that restart your windows pc. After that open your pc and see, your windows defender completely in green color. At left top corner in above given image you can see written like PC status: Protected means, it is ready to find viruses. Windows defender can scan all items on your pc. In the above given scan type choose any one of them and start scanning. If your system have virus file, malicious, it can remove and you can see those virus in history. Friends it the best and free antivirus for windows 8 or 8.1, 7 system. Just do update and make your system operation fast. If you have any doubts in manual updating of windows defender freely to send your comments.